Usually, finding fungus growing on your furniture isn't a good thing, but mushrooms are a key component of Eric Klarenbeek's MyceliumChair. In fact, the chair won't be ready to support a person's weight until the fungus is mature. Klarenbeek worked with the Mushroom Research Group at University of Wageningen to create a piece of furniture that combines 3D printed and natural materials. 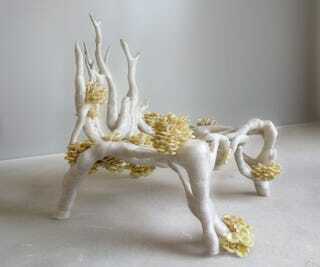 The chair is printed from straw, which serves as a substrate for the fungus, with a thin coating of bioplastic. Once the fungus is mature, Klarenbeek claims, the chair will be strong enough to sit on.